There's a great article and lots of very nice photos of the original unit at ToneMachines blog. Check it out! I've just built this to test it out and it's good to be tagged. To be honest I wouldn't really recommend it though, it's more of an active EQ and doesn't have that much boost, although different transistors would probably help (I went with 2n3904s). It's got touch of rangemaster about it but with less gain, the bass dial doesn't really boost the bass that much either. I think I'll stick with the Rangemaster I built with adjustable input caps. I found the same thing. I was looking for something quick to build and happened on this. It's basically a nice tone control. There is no real boost, but there is a little sparkle. I had to use a 22p for the 10p, would that do it? I assumed with two transistors that are capable of great loudness, there would be more bang. What is holding them back? I've missed Madferret's post completely.. So this is going to be tagged right away. 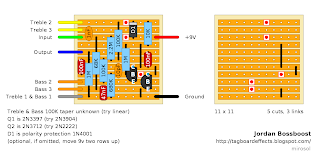 -Swap the 10K resistor from the diode to the collectors with a 20K-50K pot. -Swap the lowest link (between two lowest rows) with 2K trimmer and place a 10µ-22µ cap there as a bypass cap. Those transistors are in Darlington configuration, so by biasing them better should result in massive boost. Cool. I get the first part, but on the second bit, I remove the link, put a 2k trim in its place. Got that. But where does the cap go? I'm not sure what you mean by as a bypass. As always, thanks for all this. Positive to emitter of Q2 and minus to ground. It's called bypass cap as it "tricks" the ac signal to believe there's no resistance between emitter and ground - which has a grave impact on the gain available.